We are not discovering revolution; we are planning revolution! Today the African working class has its own Party. We are not discovering the need for revolution; we are planning for revolution. We must keep this important truth in mind as we sum up the state of the Party today. The state of our Party is influenced by the requirements of history. We are the Party where once there was none. We are the Advanced Detachment of the African working class and, thereby, the Advanced Detachment of the forcibly dispersed colonized African Nation. Our class and our nation are better off as a consequence of the existence of our Party. The character of our Party has been shaped by intense struggles within our ranks, throughout the U.S. and the world. We have engaged representatives of the imperialist ruling class in ideological and political struggle. We have experienced military assaults on our headquarters and suspected assassination of one of our most beloved leaders. Our phones have been tapped and our news organ has been intercepted, spoiled and otherwise made unusable. Our Chairman has experienced jailings, prison and extreme harassment that included slander and police beatings. From this platform we have initiated some of the most important anti-colonial political campaigns in the U.S. While the latter may have won greater support, especially from white feminists, it would have not advanced our struggle against colonialism and for Black Power. It would not have provided an explanation for the oppression of African women as colonial oppression just as the oppression of African men and children is colonial. In 1977 in Atlanta, Georgia, we used the Dessie Woods campaign to launch the first significant pro-independence, anti-colonial mass mobilization since our military defeat in the 1960s. We organized the first mass march in history in Plains, Georgia, the hometown of then-U.S. president James Earl Carter. We took militant demonstrations into Hawkinsville, Georgia where Dessie Woods was tried by a vicious colonial court. Colonialism was so pronounced in Hawkinsville that some white plantation owners had their own private jails used to punish Africans. The Dessie Woods campaign also established the conditions for much of the work to organize the African People’s Solidarity Committee (APSC) in 1976, four years after the founding of the Party. The African People’s Solidarity Committee, whose work revolves around “material solidarity” from the white community, has become the most outstanding manifestation of the correctness of our Party’s revolutionary reparations demand. Never before has the African Revolution extended itself into the colonizer national population. Never before have the white ruling class and its minions had to defend themselves from the demand for African reparations from within its own previously sheltered and generally comfortable position on the pedestal of African colonial oppression. For the first time in history the demand for reparations is more than a demand. It is actually being accomplished, right now, by the African working class through white people of the colonizer nation whose unity requires submission to the leadership of African people through its Advanced Detachment, the African People’s Socialist Party. It confirms our theory of the role of white people of the colonizer nation based on the history of parasitic capitalist development resting on a foundation of the enslavement and colonization of African and oppressed peoples of the world. The unprecedented relationship of white people organized under our leadership is a critical component to our overall strategy to overturn the colonial-capitalist social system. Our Party fought mass land reform battles in Oakland and waged major political contests with the domestic neo-colonial government officials in defense of the African working class there. We were determined to demonstrate to Africans in Philadelphia that they were not alone. We denied the vicious imperialists and neocolonialists their victory in terrorizing and silencing our struggle with the horrific murders of 11 men, women and children of MOVE and the bombing demolition of an entire colonized African community. The work of our Party has never been limited to abstract theoretical screeds. We are practical revolutionaries and we recognize that the importance of theory for our Revolution is its testing and validation by practice. As the Advanced Detachment we are always developing our theory through practice. All the work we have done, and this is only a hint of what we have accomplished, is evidence of the efficacy of our theory. As we have repeatedly stated, African Internationalism is a theory of practice. Since the 1980s we have led incessant struggles against police murder in Philadelphia and were central to campaigns in London against police violence against Africans. When our organizers were arrested in Sierra Leone, West Africa, we successfully mobilized an international public response that forced the neocolonial State to retreat. We have organized multiple independent economic institutions making us genuinely self-sufficient and created a true foundation for dual and contending power in the hands of the African working class for the first time since the Marcus Garvey movement a hundred years ago─and much, much more! The activity of our Party since our Sixth Congress in 2013 has been characterized by the same rapid revolutionary pace for which we are known. Everyone sees us as the ones who actually get things done quickly and efficiently. Black Power is being achieved even today! Much of our work today is centered in the Black Power Blueprint project in St. Louis. Although hundreds of different personalities and organizations descended on Ferguson following the uprising of the militant young working class Africans, the African People’s Socialist Party is the only organization remaining from the lot. The TV cameras, money and ruling class media are now gone, along with most of the personalities and organizations. However colonial oppression still defines the lives of the African working class. Now we are there in St. Louis, the Advanced Detachment of the colonized African Nation, the African People’s Socialist Party. The Black Power Blueprint represents a major anti-colonial advancement that has implications for the development of the African anti-colonial struggle all over the world. 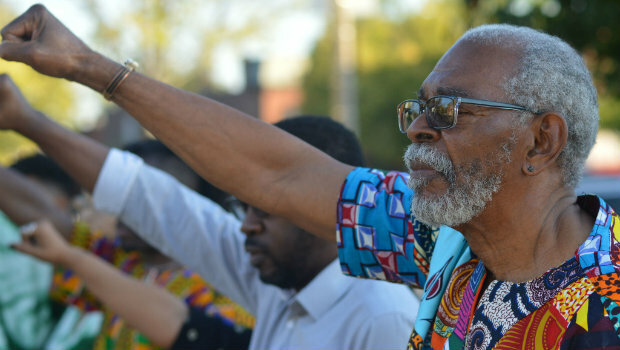 We have remained in St. Louis and we have organized a presence and movement among the working class of this community whose heroic resistance has re-energized African anti-colonial consciousness in a way not seen since the Sixties.